Yet a third test below the 1300 support zone of approx 1292-1296 (1300) support area. Dip buyers came in at 1299 or so and the market had seemingly gained some momentum by the last half hour. However very bearish price action in the last 30 minutes wiped out any kind of larger impulse move and turned the rebound into a 3 wave move up from today's low. Best count may be that a wave (iii) of [v] of Minor 1 down is soon coming. Observe the alt count is that Minute [iv] is not yet finished shaking out both bulls and bears for a bit more. SPECIAL ELLIOTT WAVE INTERNATIONAL (EWI) PROMOTION - FREE ISSUE OF FINANCIAL FORECAST (Offer ends May 31st). <------------Just click on the link to the left (EWI), become a FREE CLUB EWI member (it really is free no hassles), and get access to a lot of free EWI material. This month they are offering a full issue of Financial Forecast (a monthly newsletter). I highly recommend it for those that are not club EWI members. DISCLOSURE: I get $3 for signing people up to be a CLUB EWI member if you do it through my links. I then get a small commission if you decide at any time in the future to subscribe to one of their newsletters or other services. I currently subscribe to 4 services; the monthly Financial Forecast, Elliott Wave Theorist, and The Socionomist; and the 3-times a week Short Term Update. Update 7PM: Only thing to really say about Gold is that it has tested major support 5 times now. Most market technicians would see this as a serious concern as prices are "working" on breaking support. Like a hammer, eventually it can break. And if there are a lot of stops at $1500ish or below, then prices can accelerate. The primary count is that the SPX will move below 1291.98 - our current wave [iii] low - prior to a move above (if any) 1357.38 - our current wave [i] price low. This is the basic premise of forming at least a large 5 wave impulse pattern down from the top. As EWI likes to say, "greater bearish potential exists." Why does greater bearish potential exist? Because selling pressure picked up today. But overall volume is still less than the previous week so its a wash until we get some follow through to the downside. Again 1292 - 1296 is a very important major support area (which was the major resistance area prior). As bearish as today was, prices are still actually well above that key pivot. Wilshire 60 minute chart. Again, if this is still Minute [iv], then prices are likely to jerk both bulls and bears around for a bit longer before having the bear wave [v] win out. E-mini chart seems a mature (a)-(b)-(c) with (c) wave as an ending diagonal which is again a bearish chart pattern. Top two counts again presented. If the blue channel is broken into by a further wave surge higher, than it is likely not a true wave [i]-[ii] base channel. Nothing much to add today to the ongoing wave conversation. Prices are behaving still in a wave [iv] sideways manner. Triangle may be playing out although I wouldn't be overly surprised if it morphs into something else since it seems somewhat obvious. But we go with the obvious until otherwise required. And I always wait in eager anticipation for each issue. I am a wave junkie of course. SPECIAL ELLIOTT WAVE INTERNATIONAL (EWI) PROMOTION - FREE ISSUE OF FINANCIAL FORECAST. UPDATE 8:22PM: Channeling can get confusing but its pretty simple and helps. Channels occur at all degrees. Indeed I have shown a Supercycle channel in the past. Channels help guide the fractals within fractals. In a perfect Elliott Wave world, channels would be neat and concise. But social mood, although a fractal, is free to deviate. Additionally the effects of inflation can distort nominal prices (for a while). But eventually it all works out. 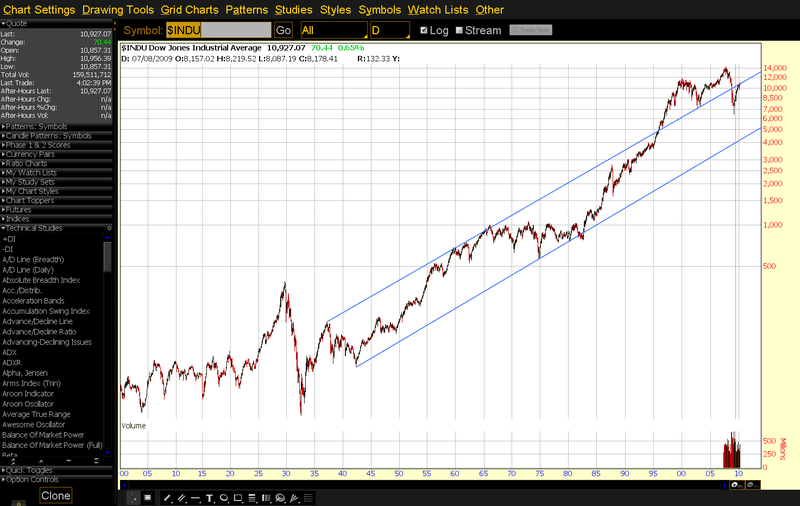 The problem is the DJIA and SPX differ greatly in channels at the moment. The DOW lacks a huge base channel for now due to it topping on May 2nd. The sideways price action over the last few days looks like a corrective wave four so we will go with it as primary count. 2. Minute [ii] up for the DJIA. The downchannel has been broken out of a bit and the entire drop of 1000+ points may require a correction. Best count would be Minute [ii] up. Obviously the counts above are not particularly compatible with each other. So the waves need to shake out some more. 1292-1296 SPX was the MAJOR resistance range that was frequently sighted by this blog during the October/November rally as being the last real great resistance area the market needed to overcome in order to possibly attain new highs. This zone was taken, held, and indeed the market made new highs to 1422 SPX. With prices in reverse, this 1292 - 1296 zone - now support - is the first great major support zone that the market needs to break to the downside in order to unlock the potential of a real bear market 20% decline or more. Having seen the market hit this price zone the last 2 days and rebound furiously each time, one can conclude the market knows how important this level is and may try to defend it. In other words it will likely take some work to chew through such as a Minuette (iv) or a Minute [iv] sideways wave, or it will become the basis for Minute wave [i] low on the DJIA. Just guessing here. DJIA has dropped over 1000 points from its high in a relatively intact channel. This indicates that it has not yet had a correction for the entire length of price drop. If it does correct the entire drop, we would call it Minute [ii]. 5 waves down from the 2011 high, a roughly 62% retrace in a 3 wave move and now impulsing down again toward its 2011 low. 5 waves down suggests the 2011 lows will be broken eventually. Also note the really big head and shoulders forming. The neckline makes a nice bear target. A closer look at the GDOW daily shows we haven't even identified a confirmed wave [iii] low. With the neckline still well below, it would be imprudent to do so just yet. 1. As you can see from the 3 charts above, each has varying degrees of counts which can throw us off one way or the other if we are looking at 1 minute squiggle counts. This is when of those times we just got to let the waves sort themselves out as they always do and maintain our general outlook (bearish long term). 2. Having said that, the BEST count that I like is the GDOW. It has been the most consistent over a long period of time. And as that chart says, we cannot be sure if we have found a wave three low or not. 3. If you're a bull and looking for an intermediate-type, multi-month low and are basing the low on an extreme of bearish sentiment, you need to perhaps look for lower prices. Why? 4. Dollar poking new highs. 5. NYMO has worked off deep oversold (twice), yet the DOW is over 800 points from its high. The best count may be simply that we are trying to confirm a Minute wave [iii] has finished in price. This thought agrees with both the SPX/Wilshire5000 and the GDOW so its probably the best stance to have for the short and medium term. It could imply that the market has moved down to a new 50 point trading range - roughly 1292 - 1343 - and we'll see a hellava lot of shaking out both ways in the next few weeks. But thats just speculation. With the worldwide PONZI revealing its true self and coming unglued day after day, I maintain an overall bearish stance of course. You know what I always say about Ponzi sentiment - there is no upside surprise in a Ponzi despite maximum bearish sentiment. Ponzi's collapse, period. Sentiment stays 100% negative all the way to the lawsuits. The virgin space identified yesterday was violated on both the SPX and Wilshire5000. The down acceleration channel was broken out of this morning but by late afternoon prices had fallen well back within. It was only a scrambling "stick save" by prices at the end which resulted in a neutral close at the upper downtrend channel line. It was obviously important for the market to show it trying to break this downtrend and for prices to at least end flat on the day. The primary count may be the one below. Granted, its not ideal but the rebound from the recent low appears to be only three waves. If this count is correct, since wave (i) and (iii) of [iii] are about equal, we may see an extended wave (v) of [iii] taking prices well beneath 1292 support. The bounce from 1292 support was certainly not unexpected. Its obvious support. But the daily candle produced today is not inspiring at all for bulls. A long-legged doji is indecisive at a time when bulls need to be the opposite. 1. Although prices poked into the virgin wave space today (approx 1324-1326), prices failed to close above it. 2. The down acceleration channel was broken for some of today but prices fell back within by end of day and did not close outside of it. 3. Daily price action candle was an indecisive long legged doji. This was a failure to decisively follow through on yesterday's rally. 4. If the market is working on wave (v) of [iii] down, the final wave (v) of [iii] segment may well be extended since wave (i) and (iii) of [iii] were about equal. This would take prices well below 1292 support. 5. Should the market rally tomorrow above today's price high, then the alternate count would move front and center most likely. Update 7:59PM: Weekly dollar futures chart. 1. Dollar had a robust price low period on high volume bullish price and volume candles. 2. Weekly candles have been heavy volume bullish rather than bearish (white dot volume candles). Simply put, green volume candles are bigger than red. 3. The red dot price and volume candles represented a bearish reversal and created a resistance point. 4. The blue channel has kept prices moving in a positive direction. 5. The red dot candle is the "sticking point" resistance that the market is trying to move above. 6. The yellow candles area represents a breakout above the red dot candle but note the move was on low volume and did not hold above the red dot candle. 7. Volume receded (smaller red candles) on the pullback from 3/19-4/30. That represented bullish consolidation. 8. Last week's price up candle (purple dot) broke above the red dot candle on higher volume. This was a true bullish push through this red dot resistance price point. 9. The new immediate support level is represented by the green horizontal line. This was derived from the peak of the previous red dot resistance price peak. A pullback to test this support would be perfectly normal. 10. If further dollar weakness pullback is required, the purple horizontal line and the blue up channel would likely be support. This secondary horizontal support is derived from the blue channel and the opening price of the red dot price candle and other price points from other candles. Simply put, last week's higher volume push through a previous resistance zone is bullish long term for the dollar. We can expect a small consolidation period and an even bigger push away from this area to the upside. Elliott wave theory is very much a logical "if, then" type application. There are rules and strong guidelines to help determine the overall count. If the market has topped, as we suspect it did, then we are looking for a bear impulse consisting of five wave segments down. If this is primary wave  down we can expect (5) waves of Intermediate degree. These (5) waves in turn will consist each of 5 Minor degree waves. Each leg down of a Minor wave should consist of [v] Minute sized waves. As a guide in this count Minor 1 wave - which consists of [v] Minute waves - should probably be between 170-250+ SPX points in length as a "guide". So far the market has declined approximately 130 points, short of 170 points in length. Also there is what I call the "virgin wave space" which often occurs near the "third of a third" wave down or the approximate middle of any five wave count down. This virgin space is easily identified because there is no overlap of subwaves both before and after the candle. The Wilshire and SPX (always identically counted but the Wilshire is used by this blog often to show clearer waveforms) both sport a "virgin wave space" that can be considered the "third of a third" wave of a Minor 1 wave down. This virgin space on the SPX lies in the range of about 1324-1326, a very narrow range but regardless its there. Using logic, if this is the virgin space of the entire Minor wave 1 down, then by strong guideline it should remain a virgin space for the entire duration of Minor 1 down. Only would minor 2 possibly come back and trace into this space. If prices rally into this space and above, then it is logical to conclude that this is not the "third of a third" of Minor wave 1 down. This information is important. For if we can find the third (which is usually the biggest panic selling spot of the entire [v] minute waves of Minor 1, then we have the approximate middle of the Minor wave 1 wave itself. Using acceleration channel techniques and "virgin space" guidelines, we can conclude that if this count below is anywhere near correct, prices must reverse lower pronto. In other words, the acceleration channel remains relatively intact and the virgin space remains untouched. WHAT IF OUR ACCELERATION CHANNEL AND VIRGIN SPACE ARE VIOLATED? If prices breakout of the acceleration down channel and the virgin space is violated then the next best count - assuming we are in Minor 1 down - would be a series of "ones and twos". A strong guideline of a series of ones and twos is that prices overlap each other. In this case wave (ii) of [iii] would be expected to rise to touch at least 1357.38 or the bottom of Minute [i]. WHAT ABOUT THE DOW INDUSTRIALS? The DJIA has an unambiguous top. It had a separate high on May 1st which is where the count must start if we consider this P down. P's count cannot start anywhere else on the Dow. Therefore what do we have on the DJIA? The best count may be the one below. The DJIA dropped exactly 1000 points. If a correction of the entire drop is required than we are looking at between a 450 -720 point rally in a Minute wave [ii]. See the virgin space? If this is the virgin space for the entire Minor wave 1 down, and it represents the approximate middle of the Minor wave 1, then there is a lot of selling left and prices must turn down soon. I think its important to have these kinds of theory discussion. When prices behave and count in a certain manner, we must alter our counts to fit the most guidelines. So far prices are locked well within the acceleration channel down and the only real viable (so far) "virgin space" is well intact. However prices must reverse in a hurry to keep this count intact. If prices violate the virgin space and break the accelerated decline channel, we should probably expect a larger rally to occur. We would then likely label it Minuette (ii) of Minute [iii] of Minor 1 down on the Wilshire and SPX and we'll just label it Minute [ii] of Minor 1 down on the DJIA. So far the bear downtrend is intact based on the evidence above (acceleration channel and virgin space intact). Today managed to shake out a lot of excess bearishness both technically and sentiment-wise. Monthly candle already looks horrible and there is still a lot of trading left. But what I wanted to show with this is that the simple RSI divergence is being confirmed. Wilshire 60. This chart was shown here and it has blossomed. Best guess on the squiggles. We have a small bump possible (i) and (ii) and its been an ugly tape ever since. I'm not going to even try and guess the next bounce. The trend is down and we are oversold but again, an oversold market is a dangerous market. VIX closed above the BB again. Pushing. Confirming the downside across the board today again. All in lockstep to the downside.